To many, South Africa’s wealth is synonymous with its diamonds and gold. But we think its greatest riches lie in another of its natural treasures: its wildlife. Kruger, Sabi Sand and other bushveld reserves protect an astounding diversity of big game, much of which has recovered from earlier threats to its survival. From the massive-tusked African elephant to the sleek leopard, from squat rhinos to regal lions, they are all here in healthy numbers that provide one of Africa’s greatest safari experiences—and with our focus on secluded private reserves, the only crowds you'll encounter are crowds of animals. Just over the border in neighboring Botswana, great volumes of wildlife thrive in unspoiled Mashatu, along the Limpopo River that Rudyard Kipling made famous in his Just So Stories. When your safari is over, one thing is certain: You’ll go home far richer than when you arrived. Maximum Group Size Just 6 Travelers! An authentic encounter with nature is hard to achieve in a big group. While South Africa’s tarmac road system and established network of lodges encourages a more bus-based safari approach, and many of our competitors travel with 15-20 guests, we limit our groups to six, lessening our impact and granting us access to small camps and remote spots mini-buses can't get to. We promise the most personalized safari experience possible! Private reserves are essential to the best African safari, especially in South Africa. In the exclusive wilderness areas of Sabi Sand and Mashatu, we explore varied southern Africa habitats in solitude, viewing abundant wildlife away without from other visitors (who are mostly traveling on paved roads inside the parks with lots of other people). We arrange chartered flights where possible to maximize your time with wildlife, rather than spending it negotiating rough and dusty roads between destinations. And from the air, you'll gain a whole different perspective on South Africa’s dramatic landscapes and roaming wildlife. Most visitors to South Africa are relegated to larger, impersonal safari lodges that dominate in the public parks. Since our focus is private reserves, our guests enjoy exclusive boutique lodgings. Our isolated luxury camps are highlights in their own right. 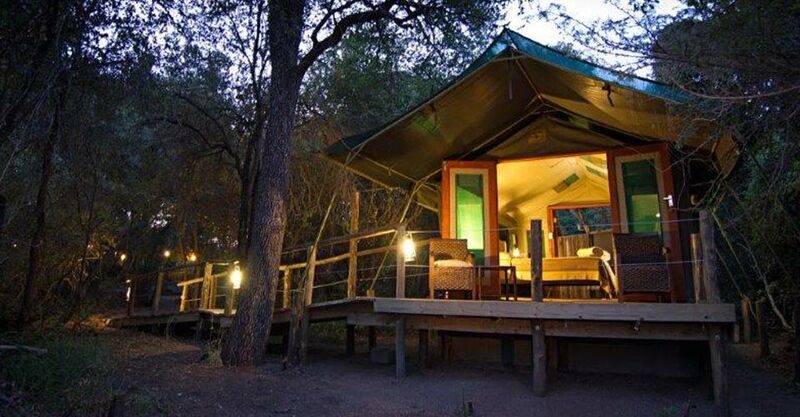 Each blends seamlessly with the natural environment, and tents and chalets have private verandas to maximize personal wildlife viewing opportunities. Most South Africa safaris concentrate on Kruger National Park, and rightfully so, as its wildlife is legendary. Naturally, our itinerary includes the Greater Kruger ecosystem, but we focus on private reserves, where visitor numbers are strictly limited. Both have an unfenced border with the park, so wildlife can wander back and forth freely. Our itinerary also includes rarely visited Mashatu, just over the border at the southern tip of Botswana, adding yet another element of diversity with a completely different ecosystem and landscape. Look for large elephant herds in Mashatu, and capitalize on excellent odds to see the Big Five in Sabi Sand. Compare itineraries: few are as comprehensive as this one! Standard safaris typically utilize cramped mini-buses. In contrast, we charter top-quality custom safari vehicles that optimize comfort. Our 4x4 Land Rovers and Land Cruisers have a suspension system designed for safari terrain, and an open-top, open-sided, tiered seating arrangement designed to maximize game-viewing opportunities. Each vehicle has 10 cushioned passenger seats, but since we don't fill them to capacity, everyone has an unimpeded side view. Each row is raised slightly higher than the one in front of it, allowing for unobstructed views of scenery and wildlife. Guided bush walks and night drives are available on the private reserves we visit, though not in national parks, where most safaris go. You'll appreciate the rare opportunity to stretch your legs while on safari as we get close-up views of interesting smaller species, which most safari-goers confined to vehicles miss. And drives after dark reveal fascinating nocturnal wildlife that's rarely seen by the typical traveler. 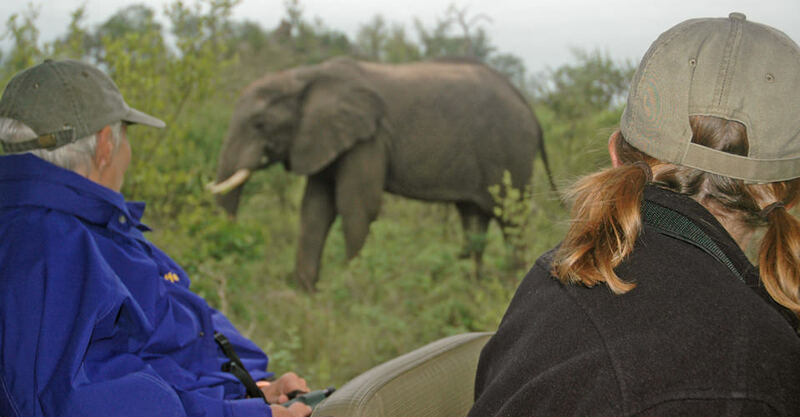 We are exceptionally proud to provide the personalized service of some of South Africa’s top naturalist guides. We employ only the most highly trained and experienced Safari Expedition Leaders. Rather than relying on less-qualified local camp guides at each stop, our NHA Expedition Leaders accompany our guests from start to finish. Our Expedition Leaders average 15 years' experience each, with additional resources provided by WWF’s leading scientists. See Expedition Leader bios and traveler comments regarding the quality of our leaders. With Natural Habitat Adventures, you receive our exclusive guarantee, which clearly states that we will meet the lofty expectations we set in our promotional materials. To our knowledge, this is the most ambitious guarantee made by any adventure travel company. Read our important promise for yourself! We care deeply about our planet, just as you do. When you travel with us, the carbon emissions from your trip are 100-percent offset—Natural Habitat Adventures is the world’s first carbon-neutral travel company. And we are a pacesetter in sustainable tourism practices in African and worldwide.